So—a lot happened since I posted last in late April! The U.S.-North Korea summit was on, then off, then on again. Now that the summit is back on, so is the familiar chorus singing: “we’ve seen this all before.” The chorus points out North Korea promised to denuclearize, then lied, cheated and reneged on the promises, repeatedly for the past 25 years. 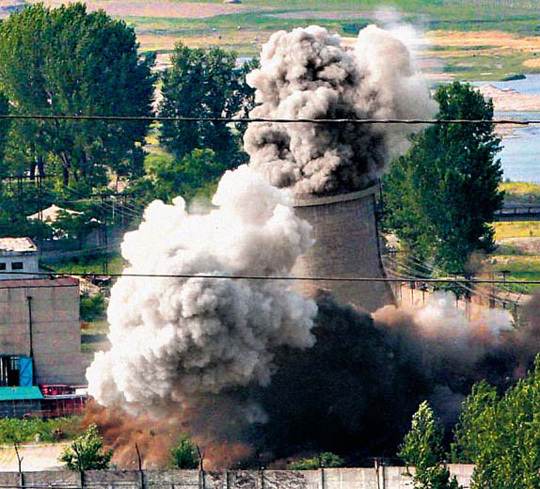 North Korea previously put on the show of taking down a cooling tower of the Yongbyon nuclear facility in 2008, and the demolition of the Punggye-ri nuclear testing site last month is also likely to be a sham, to the extent that North Korea claimed the demolition shut down the testing site irreversibly. The historical facts are, of course, undeniable. They all really happened. But it is a bit too much for the critics to argue that nothing will ever change when it comes to North Korea, as if North Korean behavior is the laws of physics. That simply cannot be true; the future never looks exactly like the past. It is entirely unreasonable to claim that time will pass but nothing will ever change, as if our world in 2018 is exactly the same as the world in 1994 or 2002 or 2007. History serves as a guide only to the extent that we can discern how the present is different from the past. Saying this time will be different is not naivete; rather, it is a rational conclusion based on noting the many differences between the past and the present. When it comes to North Korea, there are essentially four players divided into two camps: North Korea and China in one, South Korea and United States in the other. Each one of the players is in a different situation compared to the past, and so is each camp collectively. What’s different about North Korea? Here’s an obvious one: they are all but finished with building nuclear weapons and long-range missiles that could reach the United States. It has been amply established that North Korea sought the nuclear weapons and missiles as a form of deterrence against the attempts to overthrow the Kim regime, now in its third generation with Kim Jong Un. There simply is no “first use” option for North Korea that does not immediately turn it into a radioactive wasteland in a massive counterattack by the United States and South Korea. Prior to 2018, North Korea had enough reasons to cheat from its agreement: the payout for cheating was a better, more complete deterrence in the form of nuclear-tipped ICBMs. But now, the nuclear-tipped ICBMs are complete, bringing North Korea to peak negotiating position—which is a major reason why Kim Jong Un came out to talk in January 2018. It would be an overstatement to say North Korea has no incentive to cheat. But compared to 1994 or 2002 or 2007, it has much less incentive to do so. How is China different in relation to North Korea today? It is shocking to see how few analysts of North Korea consider this question, considering how China is the foundation of North Korea’s security and economy. The Sino-North Korea relation has steadily deteriorated in the recent years, as the memories of fighting together in the Korean War have faded. Shen Zhihua, China’s foremost historian on the Korean War, recently declared that “North Korea is China’s latent enemy and South Korea could be China’s friend,” adding “we must see clearly that China and North Korea are no longer brothers in arms.” The ordinary Chinese, leading a fairly prosperous life in a relatively open economy, is rapidly losing patience with North Korea that they deem backward. The derision on the Chinese internet went to a point that in 2016, North Korea requested the Chinese government ban the usage of the word “Fat Kim the Third” online. North Korea’s nuclearization made the relationship even worse: the Chinese severely dislike the fact that the nuclear North Korea raises the possibility of a U.S. military action, and worry that North Korea might undergo a Chernobyl-style disaster whose fallout would reach China. Xi Jinping’s rise to power also hurt the Sino-North Korea relationship. After Xi took office in 2012, he spent years battling his political rivals, which included former president Jiang Zemin and his cronies. Jiang remained influential even after 2002 when Hu Jintao succeeded Jiang. Importantly, Jiang and his cronies—the so-called “Shanghai Clique”—were very friendly to North Korea, using their regional base in Shenyang near North Korea to oversee the trade between China and North Korea. As Xi was sidelining the pro-North Korea faction in the Chinese leadership, North Korea became openly hostile to Xi. The relationship came to a point where, in February 2013, Kim Jong Un went so far as to declare: “Korea’s nuclear missiles would not be aimed at Washington only; they can aim at Beijing also.” (Imagine a U.S. ally making a nuclear threat to the United States!) The possibility of Xi Jinping staying as China’s leader for much longer, as Xi recently eliminated presidential term limits, cannot be a welcome news for North Korea. One of the speculated reasons why Kim Jong Un was in such a rush to murder his brother Kim Jong Nam was because Kim Jong Un feared China would use his brother as a puppet to lead North Korea after it overthrew his rule. In the other camp, there is South Korea led by Moon Jae-in, who followed the nine deeply corrupt years of conservatives Lee Myung-bak and Park Geun-hye. Moon is the most popular leader of the free world, as he enjoys stratospheric approval rating that floats between low 70s to mid-80 percent. This support allows Moon a very wide berth of operation, which he capitalized to the maximum. Much as been made about Moon’s willingness to dialogue with the North, exemplified by his daring second inter-Korean summit in which he crossed the demilitarized zone to meet with Kim Jong Un on short notice after Donald Trump abruptly cancelled the U.S.-North Korea summit. But equal praise is due for Moon’s ability to respond strongly when necessary. When North Korea tested its ICBM in July 2017, Moon Jae-in ordered his own “decapitation” missile drill, meant to show Kim Jong Un that his own life would be at stake if Kim attempted a nuclear strike. During the Pyeongchang Winter Olympics, North Korea’s special envoy Kim Yo Jong invited Moon for an inter-Korean summit; Moon declined, insisting North Korea satisfy certain “conditions”—implying North Korea must dialogue with the United States with denuclearization on the table if it wants to have an inter-Korean summit. Also noteworthy is the manner in which Moon Jae-in internalized the lesson from the Sunshine Policy era, chief among which is the importance of multilateral action. Exploiting the rift between China and North Korea, Moon has built a solid relationship with Xi Jinping. Moon Jae-in administration was the quickest in the history of South Korean democracy to hold its first summit with China. Xi apparently appreciated the effort, as he opened the meeting with Moon by quoting the Chinese maxim that appears in Moon’s autobiography: “the later flow of the Yangtze River pushes out the earlier flow”—a not-so-subtle hint that China may end up valuing its newer relationship with South Korea over its older relationship with North Korea. Moon also put in a huge amount of effort to ensure the United States comes along. South Korean officials have said Moon has spent triple the time and effort dialoguing with the United States compared to dialoguing with North Korea. 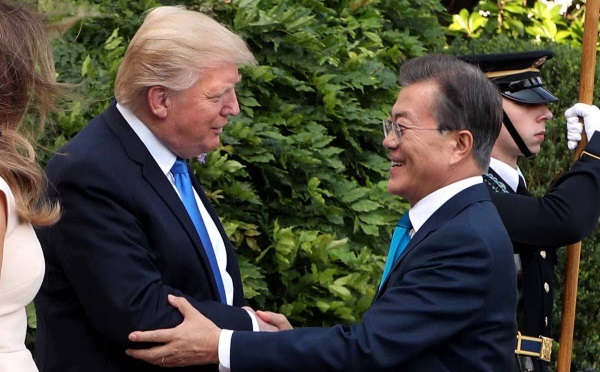 Although many initially expected that the liberal Moon Jae-in would clash with Donald Trump, the two have in fact gotten on swimmingly. Put them all together, and we can get a sense of how the events came together for the past year. North Korea finished its nuclear-tipped ICBM and was ready to negotiate the terms of concessions to be earned from giving up its nuclear weapons. To the extent North Korea was reluctant to play its hand, China under a new leadership levied unusually harsh sanctions, which pushed North Korea to come to the table to discuss a potential denuclearization. South Korea had a leader who was savvy enough to progress in a deliberate pace while ensuring both China and the United States came along. And the United States had a leader who is self-absorbed enough to think he could do something the previous presidents could not and ignorant enough to depart from the standard operation procedure when it comes to North Korea. The result is the historic U.S.-North Korea summit meeting in Singapore, now less than ten days away. Seeing the confluence of interests held by these four actors also allows us to see the basic terms of the deal that would take shape. North Korea, at a minimum, would have to halt its nuclear or missiles program in a verifiable manner, because neither the United States or China would accept anything less. In exchange, the United States would have to give North Korea some level of security guarantee for the Kim Jong Un regime, because neither North Korea nor China would countenance the possibility of a regime collapse. All four players are incentivized to open up North Korea to some degree. North Korea would open up to receive economic aid, as it would like to reduce its dependency to China under Xi Jinping. South Korea would like to reinstate regular exchanges with North Korea as a way to lower the overall military tension. United States and China would like to enter North Korea regularly in order to ensure North Korea is complying with the denuclearization program. Having this basic frame allows one to be creative about the actual structure of the deal. Here’s a pretty wild idea that nonetheless stays within this frame: a U.S.-North Korea alliance, with the U.S. putting a small contingent of its troops in North Korea that simultaneously performs three functions: (1) persistent on-the-ground inspectors who can keep a close eye on North Korea’s compliance with denuclearization on the ground; (2) security guarantee against U.S. military action, as U.S. cannot attack North Korea without sacrificing its own soldiers; (3) security guarantee against China, as a sign of commitment for U.S. to intervene if China ever attempted to topple the Kim Jong Un regime to replace it with more a Sino-friendly regime. This is a great deal for the United States and South Korea, a solid deal for North Korea, and a tolerable one for China. Yes, I know it is pretty far out; the point is not to say this will happen, but to stretch the realm of possible outcomes beyond what may seem intuitive. Am I saying everything will definitely be all fine and dandy? Certainly not. It would be foolish to make specific predictions in the diplomatic equivalent of the moon landing. The U.S.-North Korea summit may not even happen, for reasons we cannot imagine as of now. But where each actor stands in this play is not a secret. Considering the possibilities offered by how their current stances intersect is hardly the “Kim Jong Un is a Swiss-educated reformer” kind of wishful thinking. Because every element that makes up this time is different, I am hopeful this time will be different. The guy says right there that it would be foolish to be excessively optimistic, but you accuse him of excessive optimism. That right there tells me that you are too biased the other way. Wait, what? Was that really Dr. Lankov? Dr. Lankov, if that is really you, give us a sign! People will get burned eventually. And might go other side wat too far. Calm down Lankov, there's no danger to a little optimism when things are going well. That's how it logically works: people get optimistic when things are going OK, even if it hasn't in the past. Would you get annoyed at a parent getting optimistic about his child trying to emerge out of a drug rehab program? No? Then STFU. Thanks for this. I too am hopeful. President Moon is a smart guy, and having the decisionmakers in closer and more frequent contact can help lower tensions. And lower tensions can be the foundation for a lasting peace. That said, there is one important error in the above: North Korea did not develop nuclear weapons to deter American attempts to overthrow the Kim regime. In 1992-1994, North Korea successfully deterred US military action via its conventional forces. Having achieved deterrence, there is no such thing as “more deterrence.” If the nukes were only meant to deter a US attack, they were a waste of money; upgraded conventional weapons would have been a better investment, and would not have subjected North Korea to massive sanctions. 1. North Korea neutralizes the US-SK alliance, either by nuclear threats or by mutual agreement. 2. North Korea conducts regular, marginal attacks in response to routine military training, as they did in late 2010. Since South Korea won’t be able to retaliate without risking escalation, North Korea will be in a position to dictate conditions for South Korean military readiness. Over time, the South Korean military will deteriorate. 3. Sanctions relief, a reforming economy, and foreign aid will allow North Korea to develop its conventional military forces. Unlike the South, North Korea will not tolerate limits on military readiness. 4. After many years of charm and coercion (and possibly a brief war for Seoul), North Korea compels unification with South Korea on extortionate terms. This is a nightmare scenario, and I don’t think it is likely to succeed; South Korea would develop its own nuclear force long before things got out of hand. But for now, nothing in North Korea’s behavior suggests that they have abandoned their generations-long mission to unify the peninsula at gunpoint. This seems like a terribly written thriller novel. Although relative strength of NK vs SK will shift when NK opens up the economy, it will never be significantly larger (or for that matter larger than SK) as they are also limited by size of their land and population. Even if NK was able to some how break the alliance between SK and the US, NK will not be able to take over a country that has twice its population (as of now) especially when the population is extremely hostile towards NK's gov't (from democracy to dictatorship). Not to mention none of the more powerful neighbor would allow this to happen (China doesn't want instability while this is likely a call to war for Japan). "with the U.S. putting a small contingent of its troops in North Korea"
and this is where it all falls apart. No one in their right mind would think that a) the chinese would allow this or b) that the north would accept this. not going to happen. Very interesting writing on the topic. I can't wrap my mind around troops in North Korea. But your take on the players is believable, including Trump being egotistical enough and dumb enough to actually make a deal. One set of players you didn't mention was Trump's base. They're used to thinking of North Korea as the Axis of Evil. And Trump, he won't do anything to disappoint the people he desperately needs for that ego of his. that's truly awesome, bro. your article about cockfight in philipine make me remember about one and only greatest boxer from philipine, manny pacquaio. many issues mention he have big chicken farm in philipine, we are from sabung ayam online wherever called online cockfight agent literally want to talk about this issue, but many people think that's jokes to full detail at www.ayamkari.co. you can visit our blog in http://ayambangkokportal.blogspot.com/2018/06/tipe-latihan-untuk-ayam-aduan-yang-akan.html but in my blog user bahasa (indonesia means like bali ), if you want to know much about cockfight, you can contact ours. Enjoy taking advantage of Motor Club of America's many health and travel discounts on services such as hotels, rental cars, vision, and dental. We have a network of the largest brands in those respective industries. Our perks will allow you to save hundreds on everday purchase items. Save hundreds of dollars a year by booking with any of our rental car agencies or hotel chains. We Provide List Of Best And Affordable 100% Safe Packers And Movers Bangalore For Local Shifting. Professional, Trusted And Verified Movers And Packers With Price List.